I have to admit that I love fast results and efficient progress. Evie has challenged that part of me, but has taught me that the waiting makes the victory all the more sweet. 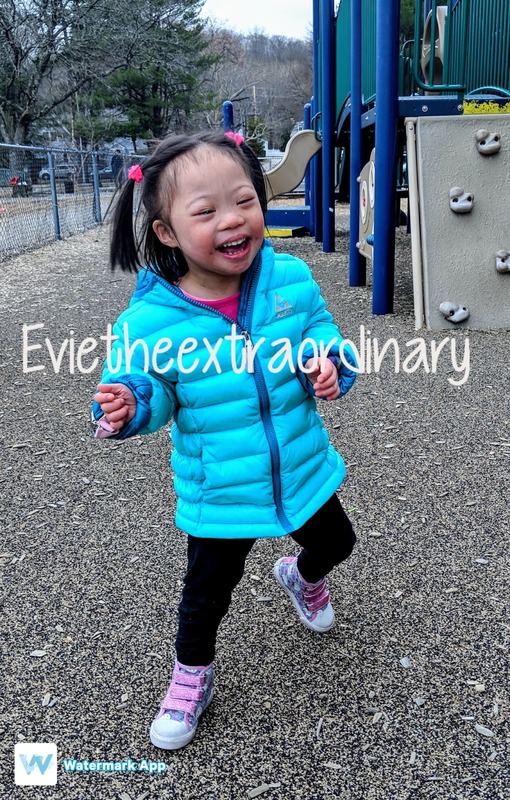 While her peers (even the ones with Down Syndrome) went on to walk and run, Evie trucked along in her walker. I have learned that I need to remember that Evie goes on her own timeline and she will get there, but 3 years of waiting was hard! But she finally reached this huge milestone, and I am so proud! And not only were her parents cheering her on, her classmates gleefully counted each step that she took, and her friends and family from afar celebrated with us. I can't wait to give away the wheelchair! Just a couple weeks later, she now walks confidently down the hallway to the couch at home, and is attacking the stairs with gusto. I feel happy every time I see her walk. She wears Ikiki shoes indoors to allow her to wear her orthotics whenever she's walking. They squeak every time she takes a step. The squeaking brings joy to my heart. We highly recommend the Ikiki shoes if you're looking for some sturdy shoes that fit SMO's!